Coconut macarons filled with fresh key lime buttercream and toasted coconut make the perfect tropical inspired treat for summer. I adore Zainab and am always in awe of the beautiful treats she shares on her blog. She is also super sweet and always willing to help fellow bloggers without any hesitation. Back in February, I had a chance to attend the Food Blog Forum at Walt Disney World and took my family along. It was an amazing experience and we had the pleasure of meeting Zainab in person and I can honestly say that she is extremely warm, friendly and even more fabulous than you can imagine. She constantly amazes me with her generosity and how she manages to find time to fit everything in with all that she has going on in her life. She and Ashley helped co-host a virtual baby shower for me last year and also sent me the sweetest care package and I am thrilled that I can be a small part of this very special time in her life. She is crazy about coconuts and also shares the same love as I do for macarons so to go with the coconuts-crazy theme, I brought along these Coconut Key Lime Macarons to celebrate the upcoming arrival of her sweet bundle of joy. Aren’t the bear ones adorable? The macaron shells are flavored with shredded coconut plus coconut extract and they are filled with toasted coconut flakes and a bright key lime buttercream frosting. The eyes and mouth are just melted chocolate that I piped on and I used mini chocolate chips for the nose. Thanks to Allie, Alice and Jocelyn for hosting the party! Hope you check out all the treats that all her blogging buddies brought along! Coconut key lime macarons made with almond & coconut shells filled with key lime buttercream frosting and toasted coconut make the perfect tropical inspired treat for summer. 107 g egg whites about 3 large egg whites, at room temperature and aged for 2-3 days. Line two large baking sheets with parchment paper or a silicone mat. Measure the almond meal, powdered sugar, coconut and salt into the bowl of a food processor. Process the mixture finely, then sift, discarding any large bits. Set aside. With a stand mixer or hand mixer with the whisk attachment, whisk egg whites at medium speed with cream of tartar until the egg whites begin to foam. Slowly sprinkle in superfine sugar. Slowly increase speed to medium-high and beat until a firm meringue forms with stiff glossy peaks. Add coconut extract and food coloring gel if desired and whisk until incorporated. Use a rubber spatula, gently fold the almond meal mixture into the egg whites. Only fold the batter in one direction by sliding the spatula into the center of the batter, then lifting it up and letting the batter fall back onto itself. It generally takes about 20-25 strokes to work the batter, but this number isn’t as important as how the batter looks. The batter is ready to pipe when it has a smooth, shiny surface and flows like lava in one large ribbon off the spatula. 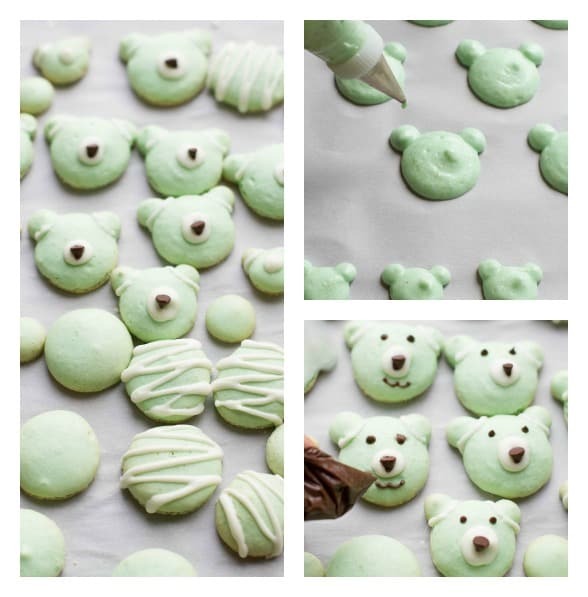 Pipe rounds or bears shapes onto prepared baking sheets, leaving space between the macarons to allow the batter to spread. Once all macarons have been piped, pick up the baking sheet with both hands and tap it firmly on counter several times. This will remove any air bubbles. Let macarons sit for 30 minutes to 1 hour, depending on humidity levels. The macarons are ready to bake when tops are no longer sticky to touch. Gently slide or remove paper templates from underneath before baking. Preheat oven to 300 degrees F. When macarons are dry to the touch, bake *both trays at the same time (*if your oven has room, otherwise bake one at a time) for 10-14 minutes. Let macarons cool completely on parchment paper before removing and filling. In the bowl of your stand mixer, beat butter on medium-high speed for about 5-6 minutes until light and fluffy. Add lime juice, lime zest and continue beating until incorporated. Turn the speed to low and slowly add powdered sugar, beating for 1-2 minutes until smooth. Optional, add 1 teaspoon at a time of heavy cream to reach desired consistency if frosting is too thick. Turn mixer back on medium and beat for an additional 2 minutes until frosting is light and creamy. Match up the cooled macaron shells with similar sizes and shapes. Pipe filling onto a macaron shell, add a sprinkle of toasted coconut and sandwich together with a second matched up shell. Repeat until all shells are used. Store in an airtight container. Place melted white chocolate and semi-sweet chocolate into a ziptop bag and cut off a tiny piece on the corner. Pipe onto macarons as desired and add one mini chocolate chip for the nose. These macarons are so gorgeous, Kelly! I’ve never attempted to make my own before, so I’m just loving these. Such a pretty treat and full of summer flavors! These macarons are BEYOND adorable, Kelly! Lovin’ the key lime and coconut combo and the adorable little faces! These are so cute Kelly. I have never tried making macaroons before, because I am worried that they would never compare to the amazing ones I had a couple of years ago in Paris. Yay for virtual baby showers! These macarons look soooo delicious and the little bear ones are just too cute. So fun! Perfect for a baby shower! I love the look of these, they’re so sweet and what a pretty colour! The macarons are too cute to eat! Your friend must be thrilled, and what a sweet and wonderful way to celebrate her and the baby. Can’t wait to her about the FBF from Disney! Thanks Eva 🙂 They were so much fun to make! I think these are the cutest macarons I’ve ever seen! Kelly, these are the CUTEST macarons I have ever seen!!!! These are perfect for today!!!! so in love!!!! thank you so much for celebrating Zainab with us today!!!! 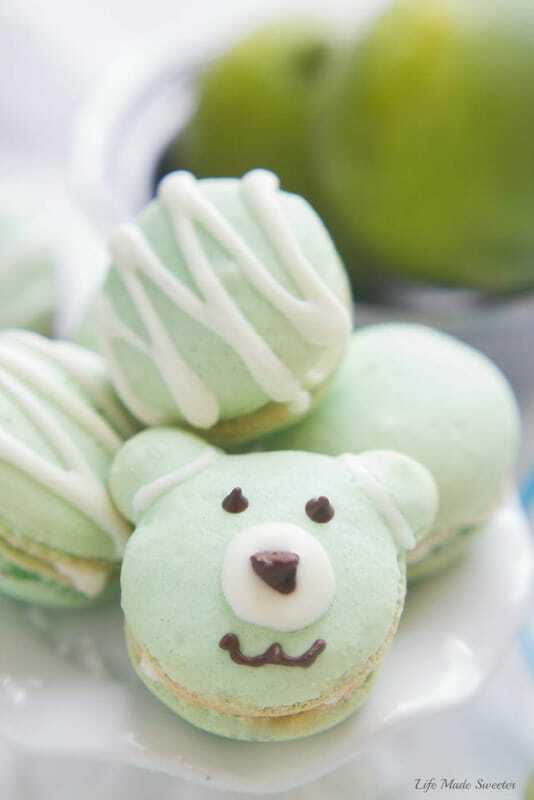 Those bear macarons are just too darn cute, Kelly. These are the perfect dessert for Zainab! And these are so very cute! These are SO CUTE!!!! Macarons and coconut are so perfect for this baby shower too! I love it. I can’t get over how adorable these are, Kelly! These macarons are perfect for a baby shower. Almost too cute to eat. I had no idea Zainab was pregnant! Guess that’s what happens when you’re out of the blogging loop for some months. Great work on these macs, Kelly! They’re uber cute. If I have enough energy I’ll make them for my own shower in August. G+d and pinned! Macaron twinning! What a great way to celebrate. And key lime coconut? Uh. May. Zing. I love making macarons so you already know I am all about these! I love the flavor, will have to try these soon! Thanks Meriem! Love your macarons! They are always so pretty! These macaroons are absolutely adorable!! You are so talented Kelly! These are perfect for a baby shower!! They look absolutely cute and so adorable!!! I would put them in a glass box! Love virtual baby showers and you’ve done a great job guys! Congrats Zainab! These macarons are too cute! Yay for virtual baby showers! And Kelly these are seriously one of the most adorable little treats I’ve ever seen! You really outdid yourself!! Ahhhh these are so adorable!! I still need to get to your level of making shapes with macarons (scares me!!). I love the flavors here (duh!!) and what a sweet post. It was beyond amazing to meet you and your family earlier this year. I still can’t believe she is one already 🙁 Thanks for the great shower dear!! Oh Kelly, you have out done yourself here. These are adorable! So perfect for a shower AND for Zainab! Glad we can come together to surprise her today! OMG these are so unbearably cute! Get it un-BEAR-ably? Oh yea I’m a cornball. But seriously these are almost too cute to eat! Well happy baby shower to Zainab! These little macarons are too cute Kelly! These are SO adorable Kelly! I mess up macarons every time (working on it, though!) so I am beyond impressed that you pulled these off AND made them into adorable bear shapes! Never have I seen a cuter macaron, Kelly! Your kids must have gone crazy for these! You’re a sweet friend who is offering an adorable gift to Zainab! What a happy day! These are so stinking cute! Perfect for a baby shower! Love these! Oh my gosh, these macarons are sooooooooooo stunning Kelly! The bear ones are so adorable! They are sooooo cute, I can’t cope! 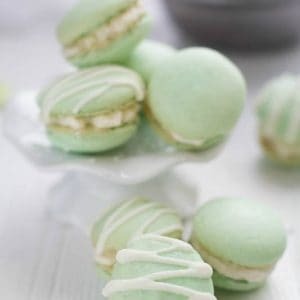 I’ve never tried a key lime macaron before, but it sounds like such an amazing flavour. Huge congrats to Zainab too! They scared me too when I first started making them. They do require a lot of time and planning but aren’t hard to make at all. You’re so sweet, thanks Cyndi! Kelly! These are the CUTEST macarons I have ever seen! All your hard work has paid off because they are seriously the best treat ever for a baby shower. And key lime flavour – YUM! I’m in awe! These could not be cuter, or more perfect for a baby shower! I love your creativity! These macarons look so adorable, not to mention so fun with the key lime and coconut flavors! So so adorable; I’m sure Zainab will love these!! 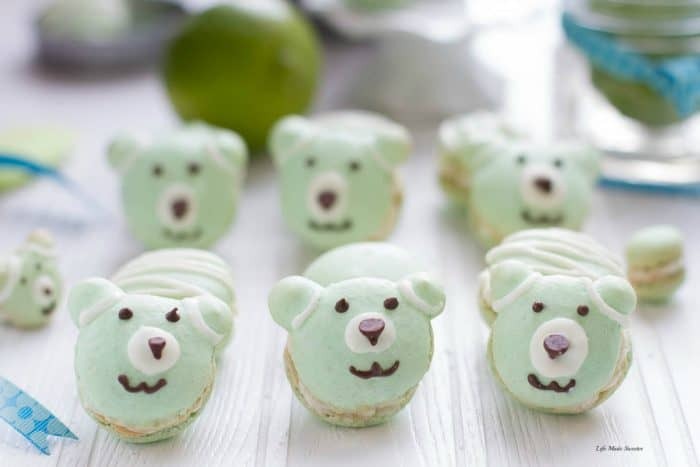 Oh those bears are too cute…and key lime and coconut are the best. These are, truly, the cutest little macarons I’ve ever seen! How adorable, and that flavor combination sounds divine. Absolutely perfect for a shower — nicely done! awwwww those bear macarons! so cute!!! these are so perfect for Z’s baby shower!!!! Oh my gosh, these macarons are so cute! I am so sad I missed out on this party, it looks like a great one! Macarons are perfect for a baby shower. These are the cutest things ever! So fun! These are so adorable! Especially with their cute little faces! Kelly, these are so darn adorable! I love the flavor combo, and they look spectacular! I am in love with these. You continue to amaze me with your macaron creations! Those macarons are so super adorable. My 2 year old son would love such a treat and I am so looking forward to make some this weekend. What a fantastic baby shower! Your macarons are adorable and perfect for such a special occasion! Sooo cute! You’re too sweet to create such wonderfully coconutty treat for a baby shower! Pinning these cuties! 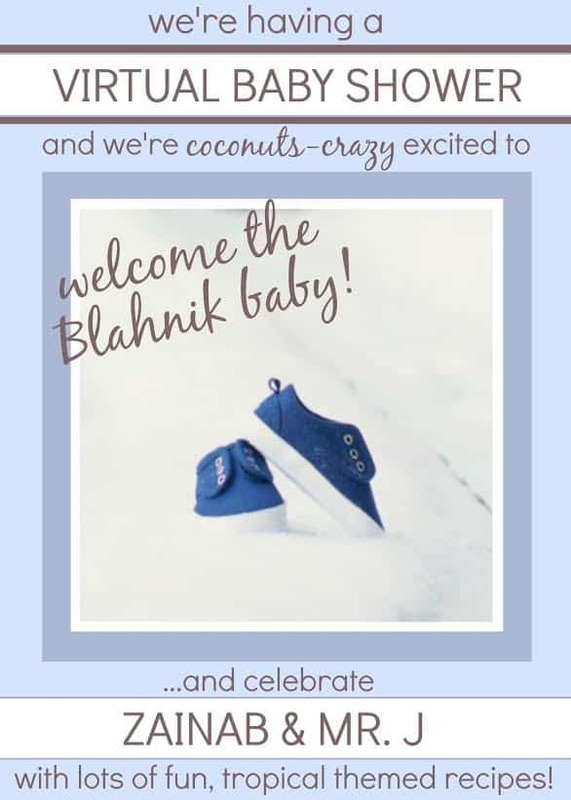 I absolutely love this idea of a virtual baby shower! 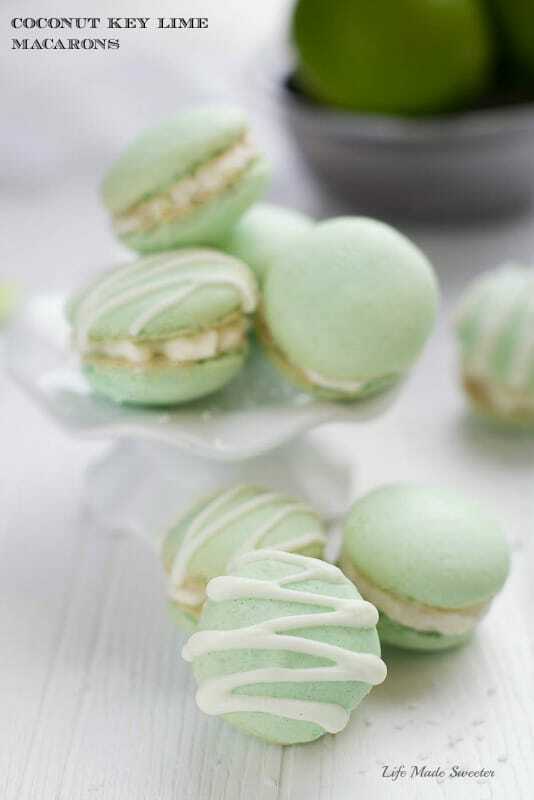 These little coconut key lime macaroons are adorable and the perfect baby shower treat! Heading over to check out the guest of honor’s blog and some of the others too! Pinning! 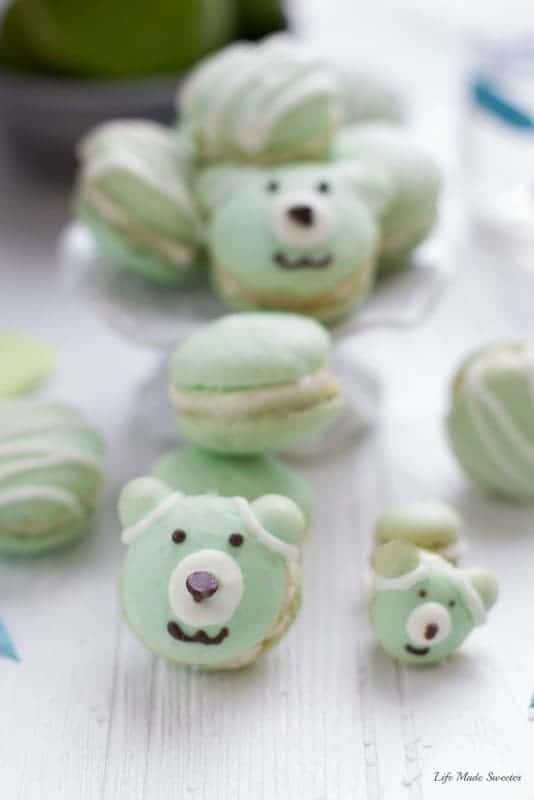 The teddy bears are the cutest macarons I have ever seen! And I love coconut…it’s one of my favorite dessert ingredients. Beautifully done, Kelly! Oh my goodness, these are so adorable! They are so festive for a baby shower! Love it! These macarons are absolutely adorable, Kelly! So cute and perfect! What a perfect treat to make for Zainab!! The bear ones are too cute, I can’t even handle it! Kelly, these are adorable! Love that you did a key lime flavor macaron – I’ve never seen one before, and I must say, I think it would easily become one of my favorites. Hope you have a wonderful Fourth of July! Okay, these are the cutest macs EVER. I am beyond impressed. Ahhh!! How fun is this?! A virtual baby shower?! That’s the sweetest! also, these look SO cute! …and delicious! YUM! OMG I have to figure out how to make this GiGi-Diet approved because MY WORD IT sounds TASTY TASTY!!! Those are seriously the cutest cookies! What a fun treat for a fun shower!! !